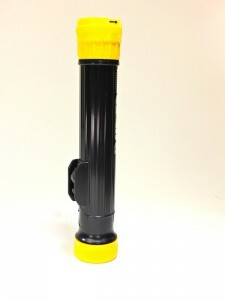 3 D-Cell safety approved flashlight with the PR7 blub. 2-position switch. Fire retardant & waterproof. Black body with yellow fittings. NSN #6230-00-270-5417. Approved for areas of atmosphere with hazardous vapors and gases. For use in the following explosive atmospheres only, gasoline, petroleum, naphtha, alcohol, acetone, lacquer solvent vapors, and natural gas.